March | 2014 | What is ML Reading? Today, a new series arrived at the library. 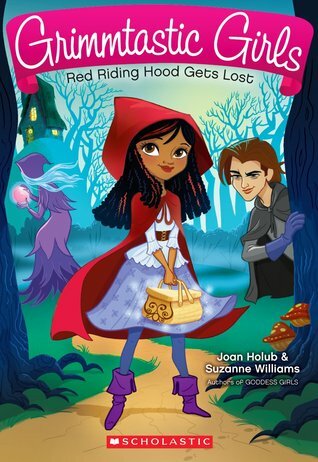 Grimmtastic Girls by Joan Holub and Suzanne Williams. I learned of the series when one of the authors, Joan Holub, sent me advanced copies of the first two books. I immediately let the librarian who orders books know about it. The authors’ series Goddess Girls and Heroes in Training are immensely popular. I knew Grimmtastic Girls would be too. The advanced copies arrived the evening ML’s good friend spent the night. Here’s my email to the author. 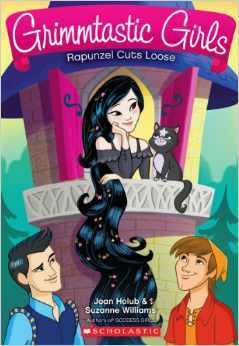 Even though I wrote a post called “Not Another Princess Book,” I am excited about this series. Based on what we’ve read so far, the princesses have depth and take care of themselves. 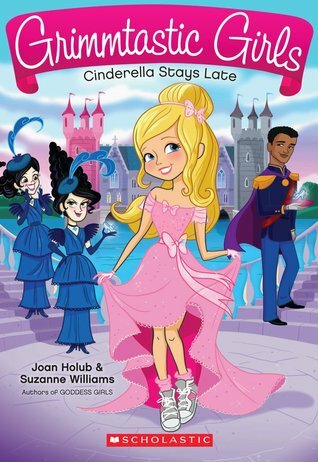 The first book starts with your typical Cinderella story… evil stepmother, mean stepsisters. From there it changes. 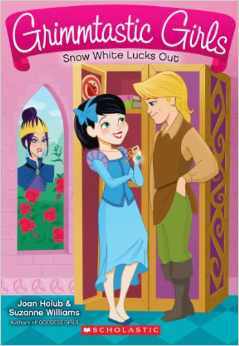 Cinderella or Cinda as she is called in the book starts at the boarding school her stepsisters attend, Grimmtastic Academy. We haven’t finished reading about the first day of school and the stepsisters have tried to sabotage Cinda three times. Luckily, she meets Snow, Red and Rapunzel. It looks like they are going to show her the ropes. 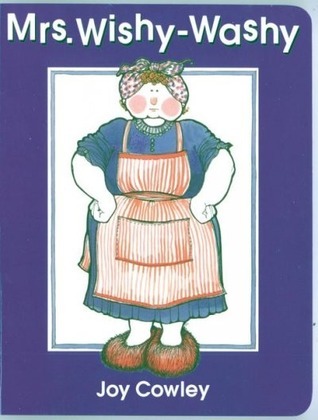 Other characters introduced include the school secretary Mrs Jabberwocky , the lunch room lady Mistress Hagscorch, the headmaster Grumpystiltskin. And of course Prince Awesome who the stepsisters swoon over. I look forward to reading more of this book with ML. Her reading is improving so she’s likely to be reading the series on her own September 30th when the third and fourth book in the series are released. 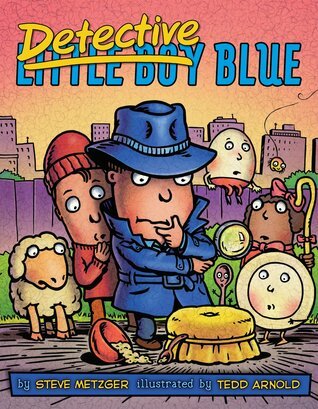 Tonight while reading Detective Blue by Steve Metzger and illustrated by Tedd Arnold, I realized I failed ML. She didn’t get parts of the story because she didn’t know all the nursery rhymes references. I feared I missed my chance. Once children reach a certain age, nursery rhymes are seen as babyish. 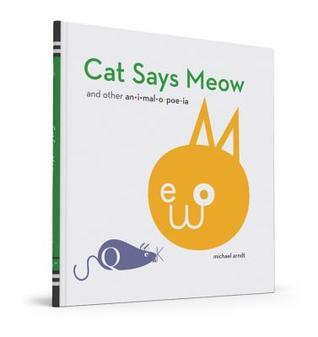 Luckily, children’s authors and illustrators are keeping them alive in children’s minds by expanding on rhymes or changing the rhymes’ words. 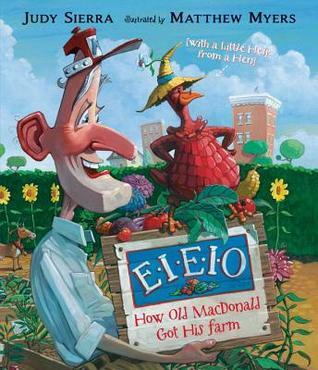 Cindy Moo by Lori Mortensen and illustrated by Jeff Mack – Cindy Moo overhears the farmer’s daughter reading the nursery rhyme Hey Diddle Diddle. She decides if the cow in the story can jump over the moon, she can too. She tries and fails. Then, tries and fails again. But Cindy Moo doesn’t give up hope. Even when the moon disappears completely. After a very rainy evening, she is able to jump over the moon. We love the various facial expressions on the cows throughout the book. 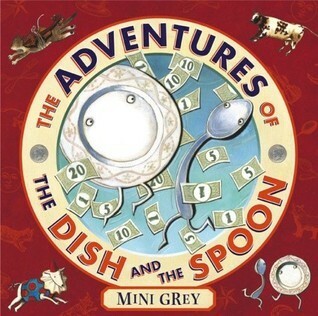 The Adventures of the The Dish and the Spoon by Mini Grey -Another book playing on the “Hey Diddle, Diddle” rhyme. 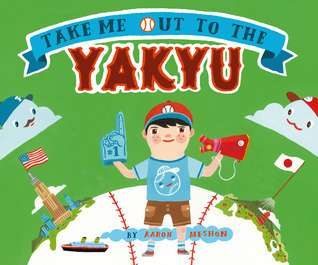 This book is a love story highlighting the fun and not so fun times the dish and spoon experience after running away. The illustrations suggest they fell off the white cliffs of Dover and floated all the way to the Statue of Liberty. After robbing a bank, dish is broken and immediately deported. Spoon serves jail time and is deported upon release. They reconnect in a Junk Shop. I’ve featured Mini Grey before. ML loves her books and I do too. The hidden comedy for adults in her illustrations delights. 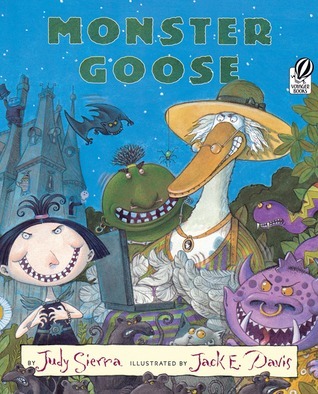 Monster Goose by Judy Sierra and illustrated by Jack E. Davis – ML calls these “Scary Nursery Rhymes.” With titles like “Mary Had a Vampire Bat” and Little Miss Mummy” popular nursery rhymes words are changed. The new rhymes follow the same rhythm of the original. ML and the boy down the street like to pretend they are zombies. So ML’s favorite rhyme was “There Was an Old Zombie.” I like “Slithery, Dithery, Dock.” The illustrations are not too scary, but scary-funny. 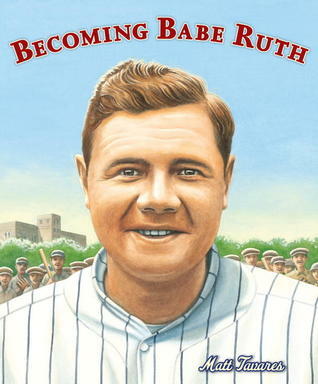 No nightmares after reading this book. 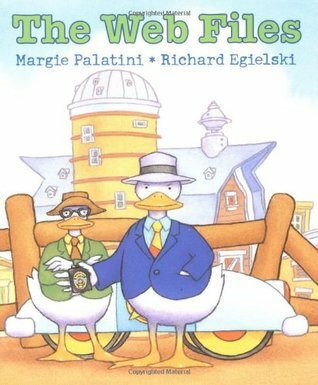 The Web Files by Margie Palatini and illustrated by Richard Egielski– Thankfully, I didn’t fail ML completely. 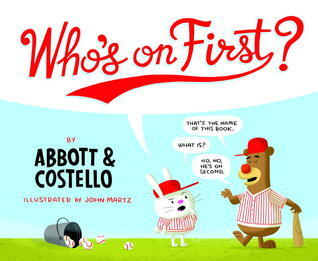 She got all the nursery rhyme references in this book and loved the play on words like “The sheep said this is b-a-a-a-d! 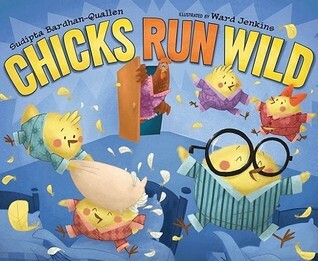 Really b-a-a-a-d!” and “quack the case.” You can’t help but laugh at all the nursery rhyme characters featured in the illustrations. Our favorite part of the book… repeating Dum De Dum Dum. 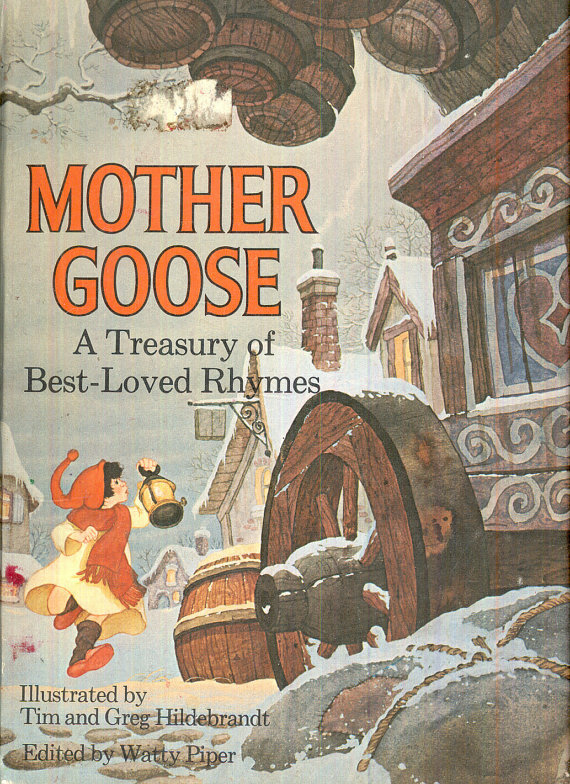 As a child, I remember pouring over Mother Goose: A Treasury of Best-Loved Rhymes edited by Watty Piper and illustrated by Tim and Greg Hildebrandt. Last night I found it on my bookshelf and shared a few rhymes with ML. Thankfully, she’s not opposed to an overdue education on nursery rhymes. She thinks it’s cool to read a book I read as a child, published the year of my birth. On the way to work recently, I noticed pink flowers on the trees along my commute. The red buds are blooming. Last year we planted one at our new house. The plan was to take a picture of ML in front of it each year. Didn’t happen yet. But it appears the trees has survived this very cold, bizarre winter. As soon as it’s full of leaves, I’ll snap the picture. 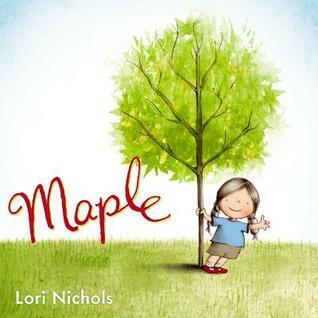 Maple by Lori Nichols is a recent addition to the library collection. 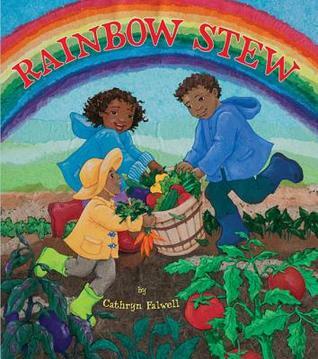 It’s a unique book highlighting the changing seasons and the experience of having a new sibling. Before Maple is born, her parents plant a tree. A maple of course. Throughout Maple’s childhood, the tree is a companion to her. When she’s sent outside for being too noisy, the tree doesn’t care. One day a small tree begins growing next to Maple’s tree. Then, a bigger surprise. Her mom’s stomach is getting bigger. Soon, a baby sister is brought home from the hospital. Maple works hard to be a helpful big sister. When the baby gets too noisy, she takes it outside under the maple tree. Next to it a small willow is beginning to grow. I am sure you can guess Maple’s sister’s name. I’ve only given the most basic of descriptions about this book. It’s so much more. A story of nature, companionship and love. One of my favorite books to read at story times for toddlers is Mrs. Wishy-Washy by Joy Cowley and illustrated by Elizabeth Ann Fuller. 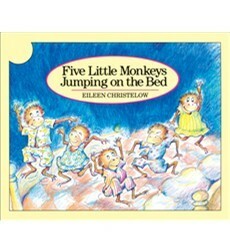 I read it many times to ML in her preschool years. Mrs. Wishy-Washy likes for things to be clean. Whenever her animals get muddy, she puts them in the washtub. Yesterday, I felt like Mrs. Wishy-Washy. Although it was bedding and stuffed animals I was washing, not muddy farm animals. In went the quilt. Wishy-Washy. Wishy-Washy. In went the sheets. Wishy-Washy. Wishy-Washy. In went the matress pad. Wishy-Washy. Wishy-Washy. In went the sleeping bag. Wishy-Washy. Wishy-Washy. In went the stuffed animals. Wishy-Washy. Wishy-Washy. In went every towel we own. Wishy-Washy. Wishy-Washy. Into the outdoor trashcan went the white blanket… triple-bagged. Even Mrs. Wishy-Washy couldn’t have cleaned it. Thankfully, ML bounced back quickly. Sadly, she shared with her mama. The washing machine’s been going for two days straight. And there is a strong scent of bleach in the air. 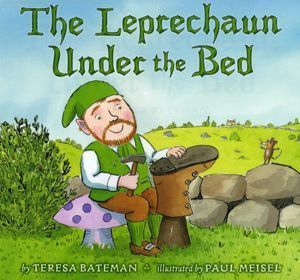 Mom, Do You Know How to Trap a Leprechaun? Lend you ear this way. Don’t you tell a leprechaun what I’m going to say. St Patrick’s Day is coming soon. Whisper how much gold there is. The reason I am choosing this book is I remember liking it. 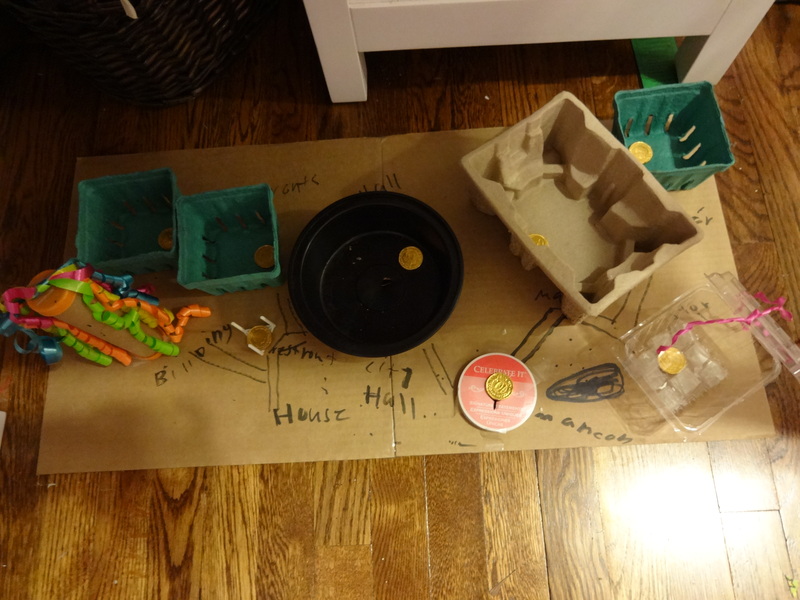 Plus, ML and I created a little village to help catch a leprechaun. It’s under her bed. The leprechaun will be so busy collecting the gold from all the buildings it won’t notice the clear glass house has a trap. In the middle of the floor is a gold piece. But all around it is super-sticky, leprechaun escape-proof tape. For those who need a visual it’s below. ML labeled most of the buildings… house, city hall, store, restaurant, mall and mansion and skyscraper. ML has a contingency plan if the leprechaun is larger. A piece of string which will trip the leprechaun and cause it to fall in the middle of a bunch of stuffed animals. The animals will guard it until we wake up. Maybe ML will be a town planner or architect one day. What is The Gruffalo? It sounds like the title of a Dr. Seuss book, but it’s not. 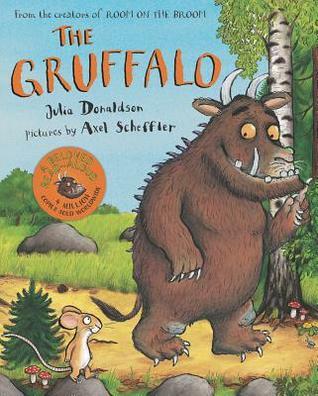 Written by Julia Donaldson and illustrated by Axel Scheffler, this book explains the smallest of critters can outsmart the largest and most dangerous of monsters. 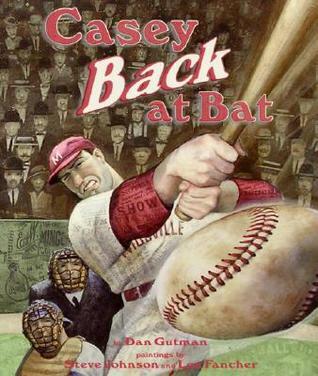 I can’t believe I am just now discovering this book. 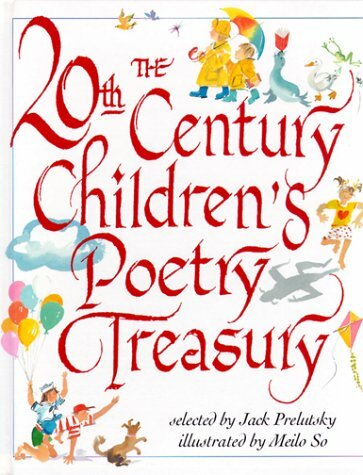 It was published in Great Britain in 1999 and is translated into 50 languages. 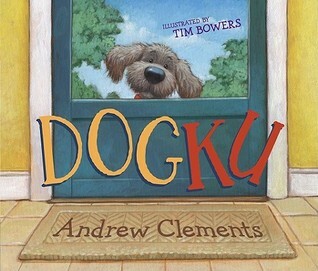 It’s “A Beloved Read-Aloud with 4 Million Copies Sold Worldwide.” Make that 4 million and one copies sold. Also, play the free online games: Find Your Name, Monster Maker, Jigsaw Puzzle, Foot Print Match. I can’t wait to tell Ml about all the Gruffalo things I discovered. I see a movie night in our future. Most importantly, read the book. It’s one of ML’s “Read-it-Again” choices. First a definition. Onomatopoeia is a word that sounds like the action it describes. Currently, it’s on my mind. I agreed to help with the Poetry Celebration at ML’s school. 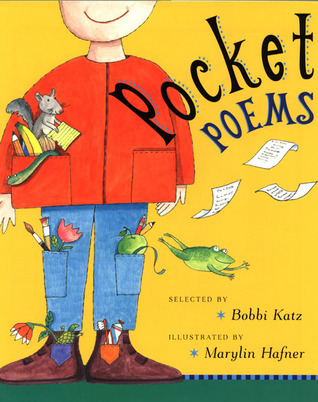 It involves creating a display, selecting poems for “Pocket Poems” and finding judges for the students’ poetry. 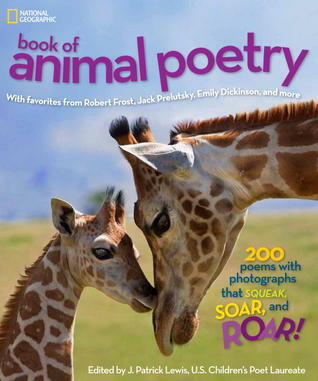 From student poetry submissions, standout poems are chosen and published in a book created through Lulu. 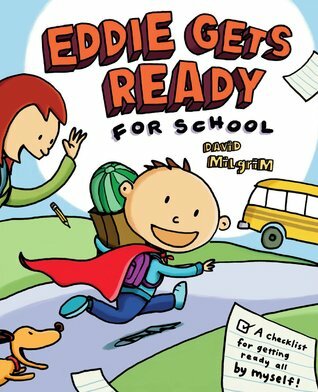 This book is available for check-out in the library and purchase. 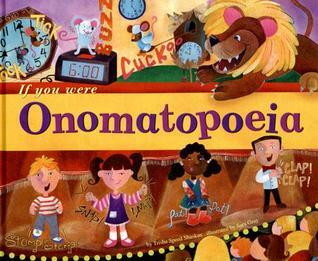 Poetry pops when descriptive words are used… the most descriptive words are often onomatopoeic. 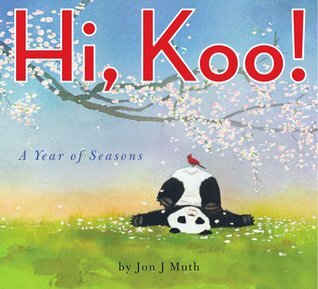 The following books succinctly define onomatopoeia. Then, provide lots of examples. If You Were Onomatopoeia by Trisha Speed Shaskan and illustrated by Sara Gray – I love how this colorful, fun book shows how dogs bark in English: Woof! Woof! in Spanish: Guav! Guav! and Japanese: Wan! Wan! I learned other things. Who knew a bullfrog says Jug-A-Rum? 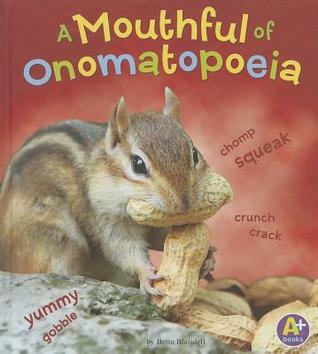 A Mouthful of Onomatopoeia by Bette Blaisdell – This book is divided into short “chapters” with clear, colorful photographs. 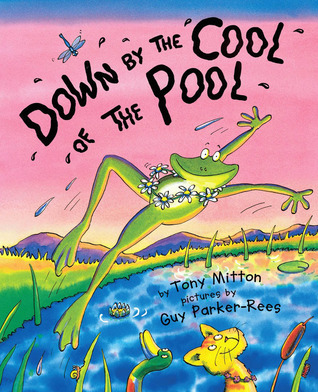 Each page spread is a chapter focusing on different types of onomatopoetic word…animal chatter, water fun, get moving, open wide, two by two, what did you say, surprise, near the pond, catch a cold, things that to, dig in, here birdie birdie. Today is Read Across America Day. Better known as Dr. Seuss’s birthday. His birthday is actually March 2, but ML’s class celebrated today. Well, they tried… school released 3 hours early. Yesterday, it was almost 70 degrees. Currently, it is 24 degrees with slick, icy roads. 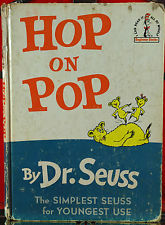 Tomorrow, ML plans to take two Dr. Seuss books from our collection to school… Hop on Pop and Green Eggs and Ham. I requested ML take good care of them because they’re from my childhood. ML responded, “Oh, that’s why they look so old.” I prefer the term well-read. According to ebay these books are “vintage.” The images above are from ebay. Our Hop on Pop looks better. Thankfully, no mold spots. 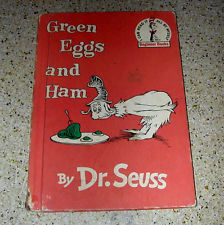 However, the spine of our Green Eggs and Ham is partially detached. Hopefully, it won’t return home completely detached.